going to see ‘shrink’ today – no, i’m not totally crazy, just a little. then, will have a nice visit with my brother. then, will head up to spend the night with my friend ruth. she does house/pet sitting and is currently doing that in sabastopol (not sure about that spelling). it’s kinda fun to visit different homes. ^_^ no office work available wed or thurs, so will probably not get home till early evening tomorrow. ruth and i like to visit thrift shops and “recycle town” (at the petaluma dump!) she is always looking for those gems people toss out – she works part time in an antique/collectibles place. she is also a restorer of antique books. no sewing pictures to post – so thought i’d share this ‘buddies’ picture (for a possible smile). 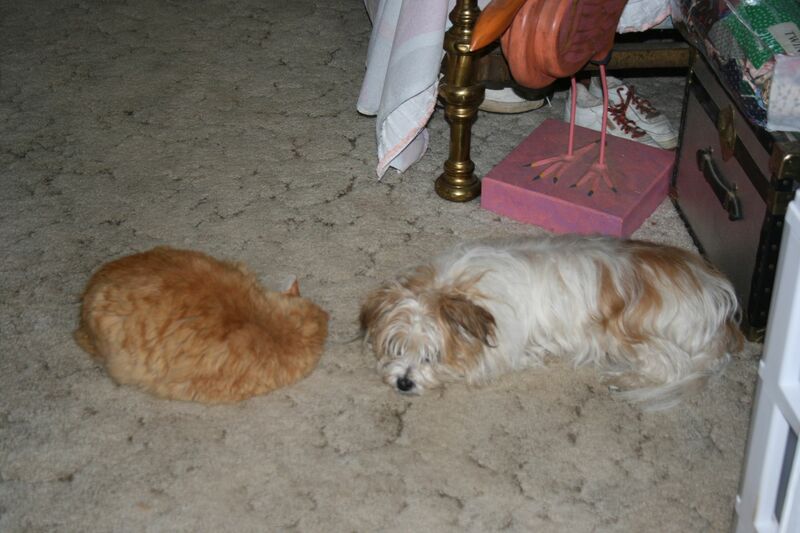 they were nearly touching just before i snapped this – then pepe (the cat) curled up more. pepe has taken to sleeping in sophie’s bed again, so sophie has been hanging out in bedroom. now pepe decided to sleep right where sophie has been. silly cat. so, sophie just kind of moved over for the day. cold now, so both staying out here. door closed.